Of all muscle injuries in runners, hamstring strains are the most likely to become chronic. One of the slides from lectures that our principal osteopath gives on his SPORTS OSTEOPATHY seminars for fellow osteopaths and physiotherapists around Europe. More than 2/3 of runners that strain their hamstrings will re-injury within one year. With big stride lengths, sprinters are especially likely to re-injury. Mostly the hamstring strain occurs just before the lead foot hits the ground, when hamstring tension peaks to resist forward motion of the swinging leg. Dancers almost always injure their inner hamstrings, which are very sensitive to stretch injuries and runners almost exclusively injure their outer hamstring muscle through contraction. grade 1 – a mild muscle strain or pull – the hamstring suffers a sudden sharp pain and is tender. Painful to move but not a major reduction in strength. grade 2 – a partially torn muscle – more painful and might be showing bruising and swelling. Some reduction of strength. grade 3 – a complete muscle tear – severe pain, can feel as if been shot in the leg, unable to use the muscle and swelling plus bruising can be widespread down the leg. The recover time from a hamstring strain or tear will depend on how bad the injury is. A minor muscle strain or pull of the hamstring (grade 1) may take a few days to heal, whereas it could take weeks or months to recover from a hamstring tear (grade 2 or 3). If you do not respect the injured hamstring and force it with training when it is not healed, itu can easily wipe oiut your season! We have seen many frustrated athletes who have not followed the guidelines but forced the ttorn hamstring into too much too early because they feel they have missed too much time in preparing for important competition. This is usually the case when they increase the training load just before the important competitions. Rest, seek expert treatment for hamstring inuries and then step by step do the rehab exercises for hamstring injuries followed by a gradual increase of training parallel with further treatment. The correct treatment of an injured hamstring can make a huge difference! What is the best treatment for a hamstring tear in London? Rather than treating the hamstring pain with over-the-counter anti-inflammatories, which can interfere with tendon remodelling, the best treatment in London to repair the pulled hamstring tendon might be having a deep tissue massage directly to the muscle-tendon junction combined with osteopathy manipulations of the pelvic bone which the hamstring is attached to. A pelvic rotation can cause a stretched and tense hamstring muscle, which injures easily when being fully stretched – often leaving the athlete surprised that it happened, so therefore it is important for the hamstring recovery to address this with manipulation of the pelvis. Physiotherapy and rehabilitation exercises will further help the hamstring tear. Because the muscle fibres of the hamstring are damaged they should be protected from further strain in the acute phase. In the first 72 hours it is important to reduce the swelling and inflammation og the damaged hamstring muscle. RICE: rest, ice, compress, elevation. Taping and strapping can give extra support to the hamstring tear whilst relieving pressure. When the hamstring tear has recovered initially it is essential to build it up with strength and stretching exercises – but gradually so as not to tear it again. What is the best treatment for hamstrings? Most hamstring injuries have a mechanical reason to be there and as such a mechanical approach such as osteopathy or physiotherapy are ideal methods to free up the compressed joints and stiff muscles plus advicing on correct posture at work and a thome. At the Central London Osteopathy and Sports Injury Clinic we seehamstring injuries very often, so we have a lot of experience in these hamstring injuries. People usually would see one of our osteopaths or physiotherapists forhamstring injuries – and conveniently based in Central London we often can see you on the same day if you book early enough. 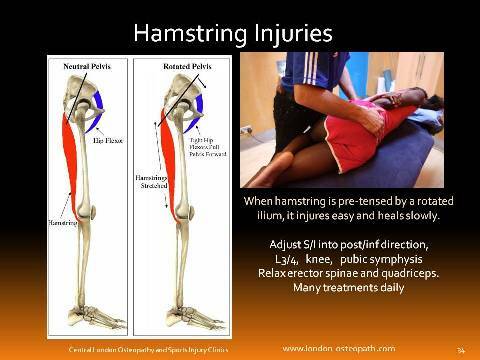 If you want to find a hamstring injury clinic near me look no further.